You can get your Agent training right here, right now, work under our authority as an Agent (Atex Freight Brokers, Inc.) and start calling on shippers for loads in just several weeks or so! Interested? Read on! After about ten years, John is reigniting his freight broker business and is offering this great opportunity for good, well-training agents. Experience and a following not required. 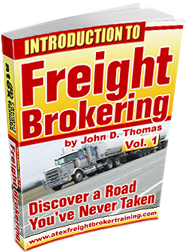 Note: We still do freight broker training for those who want full self-employment. We offer an application to work under our authority, you will have great support, you will work as an independent contractor with a 50/50 split, you pay for load board and other office expenses. Get a $200 Introductory Discount Here (Regularly $1,295 – does not extend to the Veteran discount). The training manual will not work on MACs. Are you seeking a home-based business opportunity that has a promising future? Are you tired of trying to rely on your local economy for business? Do you want to start over with a realistic and potentially high-income venture that you can work with right off your kitchen table? Maybe you are somewhat familiar with the freight broker industry. You might have friends or family who want to work with you. And the simplicity of starting a broker agent venture appeals to you. Or maybe you are seeking a new business opportunity without any trucking/transportation experience. If you find yourself in one of these situations, I have a solution for you. My name is John Thomas – the owner of thirteen-year old Atex Freight Broker Training, Inc. Over the years, I have been instrumental in helping many individuals start their own freight broker or broker agent business. My efforts have dramatically changed their lives by showing them how they can both compete and succeed in this multi-billion dollar industry. "I have 3 or 4 shippers that I am currently trying to get set up with. I am just waiting on the paperwork. I enjoyed training with you and if I know of anyone that is interested I will send them to your website". So, if you are looking for a real opportunity, then read on. This might be the most important letter you will ever read. You can become a broker agent in about 5-7 days time or less. You can be calling on shippers and brokering your own loads shortly thereafter. You can learn how to do all of this one-on-one over the telephone and internet. No travel or travel-related expenses, you don’t have to leave your family or work, you can do it all from your kitchen table or from your office. Now – imagine yourself just for a minute – it’s a beautiful morning and you’re going through your database of customers, calling them one-by-one and asking if they are looking for any trucks today. Finally, you hit a “hot” one. They have a load of steel rebar that needs to be picked up in Fort Wayne, Indiana and delivered to Dallas. They need a flatbed that can haul a 60 foot load (which requires a permit) and the load weighs 48,000 lbs. You go through your database of carriers that you’ve built or you search one of the load boards and you call a flatbed motor carrier. You ask them if they have a truck available to pick up in Fort Wayne and deliver to Dallas. They check their availability and say, “Yes – give me the details”. You give them all the details and tell them you’ll immediately fax the set-up package and confirmation. In a few minutes your broker gets the signed and dated agreement faxed to him. Your broker checks out the shipper and carrier and gives you the “Okay” to proceed. Several minutes later, the truck driver calls you. He’s calling to let you know he’s ready to roll and to ask for any last minute, specific instructions. You give them to him and wish him a safe trip. After delivery, the carrier sends an invoice along with the related paperwork to your broker. Atex immediately turns around and invoices your shipper customer. Several days later, you expect payment from Atex. When you receive your payment, this completes the cycle. Is it always this easy? Absolutely not. It’s a service-oriented business and it will take time to build solid business relationships. But many times, it IS this simple. By this time, you might be asking, who IS John Thomas and why should I be listening to him? What are his qualifications? What are his credentials? Just exactly where is he coming from? These are legitimate questions. Without a face-to-face relationship, there’s a good reason to be skeptical. I’m that way and I expect most people to be the same. So, let me explain why you should be listening to me. I’m completing thirteen years of freight broker training. My total training career spans almost three decades, working first as a degreed accountant and then as a CPA/consultant, helping many others like yourself get set up in their own business. My accounting background provided numerous opportunities to analyze many businesses both large and small. Most were small business start-ups. I am the author of numerous “How to Start Your Own Business” and “Financial Planning” materials and I have conducted workshops for individuals and small business owners. The resulting benefit I gained was to be able to put together simple, comprehensive and step-by-step procedures for others to follow. I excelled in doing just that. Before I actually started the freight broker business myself, I spoke with about 20 freight brokers here in El Paso. I also spoke with some shippers and truck drivers. The information that was collected was invaluable. It formed the basis for my business plan that secured my line of credit. My broker agent training program, therefore, is based upon my current freight broker training, my own, previous freight broker business, Atex Logistics, Inc. where we moved produce and other cargo by dry van, flat beds and reefers. In a word, my training program is the result of not only my own freight broker experience but the many years of real-life business know-how. So, when it comes to working in the freight broker industry, I know what is needed, I know what is real and I sometimes know what is just plain dumb and unrealistic. When you approach me either before or during training, I’ll give it to you like it is. No, fluff and no hype. My clients have told me, “John, that’s what I want to hear”. Shana form Oregon called to tell me she earned $6,000 the first month! What about the current and future outlook for the broker agent industry? The freight broker industry is one of the most solid and gigantic industries in the world. As a broker agent, you will find shippers who have cargo to transport and you will find motor carriers who are ready, willing and able to move the cargo. At the end of our training, you will have the tools and knowledge to work confidently with these players. In this gigantic industry, there are thousands of potential customers waiting for YOU right NOW! All you have to do is drive down the road and just try to count how many semis you see every minute. There are a massive number of trucks out there. Thousands and thousands of products are being shipped every day – and many have probably been initiated by a broker agent. This industry is for REAL, it’s here to stay and it’s only getting bigger. As a broker agent, you will create and coordinate the complete transaction between your shipper customers and the motor carriers. You will then receive a commission for your matching skills. Further, after gaining the trust and confidence of both shippers and carriers you will get repeat business – you will guarantee yourself an income stream for as long as you are in business. This is when things really start to happen! Many individuals have spent tons of money and wasted countless hours on pursuing frivolous ventures that promise nothing but lining the pockets of those who are selling them. While working as a broker agent will take time to get established, it is a REAL opportunity. Our broker agent training program is comprehensive, affordable and effective. We’ll take you by the hand over the telephone and Internet. We will pile a ton of information on you and, with our step-by-step procedures, we will keep you focused on all of the essential details of working as a broker agent. The freight broker industry is real and there is always a high demand for good broker agents. There are many ways to benefit in this industry. A broker agent works for another freight broker and does not need to obtain a broker authority. The agent works under the authority of his or her freight broker and is not responsible for invoicing or paying the trucks. The broker agent option is less costly because no broker authority is required. And the broker agent splits his or her commission on each load with their freight broker. Most of the agent’s time is spent searching for new customers, finding trucks and coordinating the movement of cargo. We’ll help you create your broker agent business that is fully operational and geared to achieve the success you desire. With our training you will know what to do, when to do it, how to do it, with whom to do it and, equally important, WHY you are doing it. We take the mystery out of working as an agent and help you “cut through the mustard”, so to speak. In addition to the training manual, you receive numerous “handouts” some of which are templates that you will use to help you monitor your progress as well as help you make decisions on where you should focus your time and effort as you build your business. We go into the details of finding shippers and getting set up with them, taking the order, learning how to calculate rates, using the load boards, searching for available trucks, getting set up, and so on. The broker agent program is a step-by-step process where the sessions flow in logical sequence with the manner in which you will be conducting business. After formal training is complete, there is unlimited support. Let me repeat – there is unlimited support for broker agent training no matter whether it’s one, two, six or how many other months later. Your training manual is written in great detail and will serve as a remarkable resource for months after training. The training manual along with the “handouts” and unlimited support are your ultimate resources in guiding you toward your successful broker agent venture. You do not have to compete with others in a classroom setting. There is no travel involved. Other agent programs will have you travel with meals and lodging expenses, plus leaving your family or work for a week or more. This is important – if you can run an entire broker agent business over the telephone and internet, you can certainly take your training the same way. There is no contract and no quotas working for Atex Freight Brokers, Inc.
Our training program is the result of many hours of preparation and compilation. They are the result of over 30 years of accounting, financial, marketing, consulting, training and business experience with both large and small companies. If we had to put a dollar value on the creation of these training options, it would run well into the tens of thousands of dollars. With our broker agent training, you will save literally hundreds of hours and thousands of dollars. There is a massive amount of procedures to be learned, remembered and established BEFORE and during your broker agent work. It would take you an estimated two to three months just to get organized by doing it yourself – once you learn what you need to do. There are some who venture out and try to learn this on their own. This is possible but they will never learn from those who have “been there and done that”. Our broker agent training program will introduce you to some of the potential pitfalls and how to avoid them or how to deal with them if and when they arise. There is no greater threat to your success than to come across as unprofessional and inexperienced at the same time. These will stick out like sore thumbs without proper training and preparation. Again, we will train you on what to do, how to do it, when to do it, with whom to do and why you are doing it. The business concept in working as a broker agent is very simple: you normally first find shippers who have cargo to haul; you then find motor carriers who are willing and able to transport the cargo; and you then put the two together and get the cargo moved to earn your commission. In the process, however, you need to be extremely detailed oriented. You need to dot every “I” and cross every “T”. You need to do all of this in a fast-paced work environment. Your income potential is unlimited. However, you normally don’t start out with a big bang unless you have contacts ready and willing to give you work. After getting established, your income is unlimited. Make no mistake about it. This is no “get-rich” venture. You will work hard but once you get established, you can expect to reap 10 to 20 times your initial cost or much more. The work requires determination and working smart as well as working hard. But in our training, we’ll help you develop realistic expectations – we’ll help you focus on a workable strategy. You may take comfort in the fact that, while you are building your agency, your start-up, overhead and operating expenses will be very low – telephone, load boards and office supplies will most likely be your biggest expenditures. Believe me, there is no other training that will give you what you need as you build your own successful broker agent business – freedom to work at home, freedom from bosses, freedom to set your own goals that YOU and YOUR family desire. When it comes to beginning any business venture, it’s absolutely essential to know – and know how to apply – good marketing skills. We show you some sales and marketing principles and techniques that will help you outperform your competition. One sure fire way to success is to go where your competition is NOT going. We’ll show you how to do this. We’ll show you all these plus much more. As mentioned above, many individuals think they can learn this business on their own. The business concept is simple enough – find shippers and then find trucks and put the two together. But there is a whole lot more to this than what meets the eye. Now, by now you are probably wondering how we can do all of this. I have the good fortune of having gotten my training organized to such a degree that it allows me to expand back into actual brokering.This is good for me and it is good for you as well. The apparent simplicity in working as a broker agent is deceptive. Between the shipper and the motor carrier are many detailed, step-by-step procedures. If you mess one up – you’ve probably messed up the entire sequence. The result? You’ve not only lost a load but you might have lost a customer as well. Ultimately, you might just lose your entire business. Here are the facts – you’ll be working with an expert who knows how to deliver comprehensive information at YOUR speed and with YOUR schedule. you’ll be building a “long-term” relationship with our unlimited support after formal training. Your cost for the comprehensive broker agent training done one-on-one over the telephone and internet with unlimited support is regularly $1,295. BUT, if you act fast for the training, you will get an Introductory rate of only $1,095!. The broker agent training program covers everything you need to get started and then to operate successfully. You will be able to come on board without a lot of hassle. With the broker agent training, you will learn where to find shippers, how to take the order, how to get set-up with shippers, how to calculate rates, how to use the load boards, how to book the loads, how to help prequalify your carriers, plus much more. With our instruction, won’t be scratching your head wondering what to do after this training. Our broker agent training is customized for YOU. With the one-on-one telephone instruction, we answer your questions REAL TIME. It’s a powerful, intensive and spontaneous interaction. With our telephone training, you do not need to compete with anyone else. How many classroom situations are there where people have had to compete or take a second seat to one or two more vocal persons who may not always be asking the questions that YOU desire? YOU are at the head of the class with us. With our telephone training, we are accessible. When you have a question or need some feedback whether it’s during formal training or three, four or six months later – whenever – all you have to do is call or email. Our broker agent training accommodates YOUR schedule. Often times, your most urgent questions will arise after formal training. We are only a phone call or email away. With our broker agent training, you gain a competitive edge. This training includes Load Manager spreadsheets to help you record and monitor each load which will help you make decisions on who or who not to work with. We’ll give you some unique search techniques that will help you uncover shippers who probably aren’t being called by every freight broker in the country. Our broker agent training is low-cost. You get great value by avoiding other training programs that require your paying for a lot of overhead, travel related expenses or possibly expensive software. Use my 30+ years’ experience in working with small business startups. I know what works, I’ve learned a lot by working with a lot of REAL businesses. For the broker agent training, you receive a newly updated and comprehensive training manual in eBook format. You receive about 25 “handouts” in either MSWord, MSExcel or PDF format, including several videos. Once you receive and download the materials, we get together over the telephone. We set up training sessions that vary from one to two hours. Again, we accommodate YOUR schedule. You tell us what suits you. Then, we get into the details of broker agent training. You will have your computer on and the training manual up in front of you before we call you. We go into each session after you have read each session and marked any areas that need clarification. We go into a number of website resources together while we are on the phone. We teach you what to do, when to do it, how to do it, with whom to do it, and why you are doing it. After formal training which might take a week or possibly even a little faster or longer, we will train you until you get to the point where you know what you need to know – and you’ll tell us when that is. It’s powerful, it’s effective and it’s efficient! Our broker agent training puts you in business quicker than anything else and without losing the quality that you will need to work successfully. All this for the low Introductory price of $1,095. Do NOT purchase any broker agent training unless it meets the following six criteria. There’s a lot of confusion surrounding the freight training field. I want to give you six criteria that you absolutely, positively must have in any solution you seek. You should expect a “Yes” for each item. Does your broker agent trainer have REAL freight broker or broker agent experience? Can you train without being pressured into buying expensive software? Is the training manual detailed, “nuts & bolts”? Do you have unlimited support after formal training? Does the cost of your training fit your budget? Perhaps most importantly – is your trainer looking to build a relationship rather than a “quick sell” – in the door, out the door? You could easily spend several thousand dollars or more for other training that requires traveling away from home – and you STILL may not be certain that you will receive real value for not only the money spent but for the time involved. So, what’s the catch? Why am I so much cheaper than most other broker agent training programs? I work out of my home and with very little overhead expenses. You avoid paying for layers of salaried employees, rent and other facility or overhead expenses. You get comprehensive training – but we don’t needlessly dwell on material that you can easily explore on your own after receiving proper preparation. Training and materials are very well structured with a logical flow that is as efficient as it is effective. The training fee is not “padded” in order to turn around and give you some freebies. So, how do you get started right now? You will download your training manual from this website as well as the other materials. We call you to set up a starting date and time. And at that point, we begin training. Of course, if you have a question first, call me at 915-400-4732. I’ll try to answer it. If you respond right away, you will (1) get in on the Introductory rate, (2) start working under our authority, and (3) be one step ahead of the many others who are getting into broker agent work every month. The majority of these will fail without proper training. Get trained now! P.S. Train over the telephone and Internet. Save money. Save time. Save travel. Stay home with your family while you learn and earn from home. P.P.S. This is a REAL business opportunity that is waiting for you. Don’t put this off any longer. Act now. © Copyright 2005-2017 Atex Freight Broker Training, Inc. All Rights Reserved.